warranty and available extended coverage. no fee. Just ask your dealer how you can buy extended coverage of 12, 24, 36 or 48 months. want the Good Times Protection Plan. *Depending on the program purchased. Good Times Credit Plan not available in Canada. Ride responsibly. 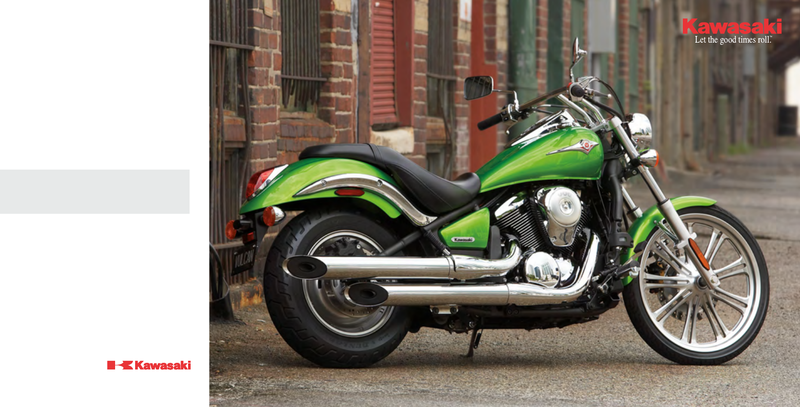 Kawasaki believes safety begins with us and continues with you. in your owner’s manual. Remember, riding safe is smart. To purchase accessories, see your dealer or visit our Web site. Specifications subject to change without notice. Availability may be limited. Always wear a helmet and appropriate apparel. motorcycle—your course sponsor will provide one courtesy of your local dealer. Action Photography: Professional riders on a closed course.